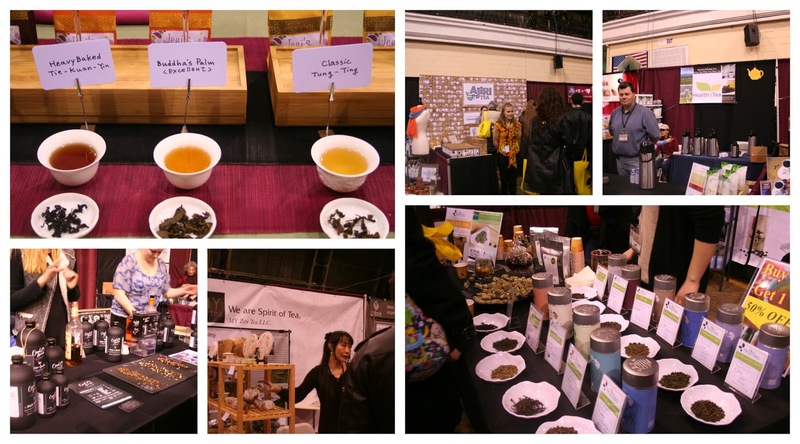 It's been over two weeks since the NY Coffee & Tea festival, and I finally have time for a recap! There was much to see, many people to meet, and good friends to share the experience with. As a full fledged introvert, it's never an easy time to wade through crowds and chat with new people. But it was a wonderful day. I now have many more teas and companies to write about in the coming weeks! One of the first booths to greet patrons was Owl's Brew. They had a long line last year, and this year was no different. Everyone wanted a sample of their delicious boozy tea drinks. I tried the 'classic' which includes sweetened English breakfast tea and lemon peel. I have to admit I was surprised at just how delicious it was. I made a mental note to swing back and pick up a bottle, but by the time I did they were sold out! They are in lots of local markets though, so I'll still be able to have a delicious springtime tea cocktail. I've been following The Meaning of Tea on twitter and facebook for awhile, and I was happy to have a sample of their teas. I discovered they grow herbs for their teas at their organic tea farm in Vermont. I love that! I took home their Golden Monkey and Golden Lion Masala Chai teas, and I have to admit they are both quite good. The Masala Chai is a gorgeous mix of tea, herbs, and spices.Both teas need their own blog post (coming soon). I was also given this book, which I can't wait to read! I truly appreciated their kindness and generosity. I had a fun chat with the guys from Andrews & Dunham and picked up a Spring Keemun, their latest release. I love their passion for tea, and their design aesthetic. I've tried a few of their teas over the years, and they are all fantastic. They have the best promo materials, too. Love the pins and tattoos they gave out. They sell 'damn fine tea', indeed. I was excited to see a booth for Joseph Wesley Black Tea, a relative newcomer to the industry with quality black teas. Joe himself was there, and it was lovely to meet him. I admire his passion and dedication to artisanal teas. I've tried a few of their teas, and can't wait to order more. A proper review will be coming soon. I am definitely hooked on their black teas. If there was an award for the most cheerful folks, I think it would go to Simply Good Tea. These guys were happy, friendly, and thrilled to chat about their tea subscription company. They are trying to bring quality tea with added convenience and affordability. Definitely a great idea. They are currently taking subscriptions via indiegogo if you are interested in checking them out. I look forward to seeing more from them in the future. 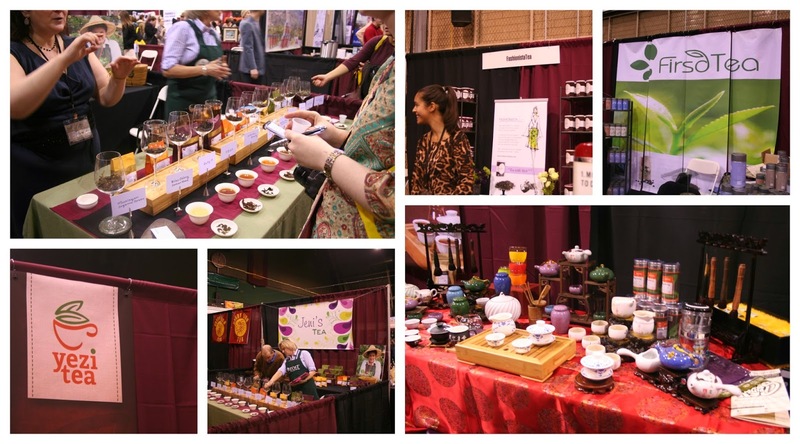 The most memorable experience from the day is the tea and chocolate pairing event I attended. Jo Johnson is one of the most elegant and passionate tea people I've met. She gave a fabulous and informative presentation. Doesn't drinking tea and nibbling on chocolate sound like an amazing way to spend the morning? Everyone sitting around me fully enjoyed the interactive presentation. I was also able to quickly say hello to Niraj from Happy Earth Teas which was lovely, but too brief. Hopefully we'll have more time to chat when we visit family up in Rochester.I also met up with two old friends and we walked the booths together. It was great fun to hear about what samples they liked and didn't. We sampled, walked, and chatted the afternoon away. Well, I will definitely be on the lookout for this festival next year. Great post/pics. Thank you for coming and for the mention It is always good to see your bright smile. Note there will be another replay of the Chocolate and Tea Pairing at Press Tea. Can you imagine those two powerhouse flavors combining. Let me know if you would like to attend. I would like to attend a tea festival one day and to take better close up photos as you seem to have done. Thank you for sharing!